Slings were all the rage in the Neolithic era and in biblical times, long before the bow and arrow existed. However, its grandchild, the slingshot, enjoyed a more infamous reputation, often associated with vandals and problematic youth. In recent years we realized that it is quite a useful tool, and one of the best choices when it comes to hunting small game; sometimes, depending on the product and the hunter’s skill, slingshots can even be used for medium-sized game. Much like with other types of gear, the skill of the hunter is crucial. Your accuracy depends greatly on the level of familiarity you have with this product and to some extent on the design of it. A person who has has a fair share of practice tends to have a more sturdy and firm arm, which is essential here. How Accurate is a Slingshot? Precision is also heavily dependant on the quality of the materials being used. Aspects like design, grip, and the elasticity of the band play an essential role. So in an ideal scenario, a great product and an avid shooter can make a slingshot an incredibly deadly and precise weapon for the intended purpose. For beginners, it wouldn’t be a bad idea to acquire a laser sight, which will often improve your shots while you become more proficient with this simple, yet useful tool. Keep in mind that while the gear used is vital to your effectiveness, nothing beats practice, which is free. The grip should have a comfortable build to avoid the fatigue that comes from constant use. The entire frame should also be sturdy. You want a robust body to apply higher amounts of force and therefore get more distance and power on your shots. The elastic is also an essential part because it’s the most significant factor to determine the power and range you get. Just like with bows and arrows, this represents the force applied to the elastic. This factor determines how far and powerful your shots can be. If you want to deliver a deadly shot for a humane kill, then a high enough draw weight is what you need. Some bands come measured with their respective draw weight while others can be more of an estimate (usually around 10 lbs). A slingshot design is, in general, relatively simplistic; that is what makes it so useful. Many models tend to be easy to carry around in most pockets, not too heavy or big, so it’s easier to use them for prolonged amounts of time without getting tired. Since slingshots are a situational and skill dependent product, the one suited for a specific person may not be fitting for another. Here’s a list we’ve compiled of the best models currently on the market, based on several different categories so you can find the perfect option. Model fits any shooter size. Elastic band is not as durable as in other models. This option is versatile and useful for different types of activities, mainly for hunting small game like birds and rodents. It can deal severe damage on large animals, but it’s not fit for humane kills on anything larger than a beaver. It is pretty accurate thanks to a combination of an adjustable, sturdy frame and a comfortable grip. People without much experience can easily hit targets at 15 to 20 yards, while more seasoned individuals can perfectly hit a target 50 yards away. 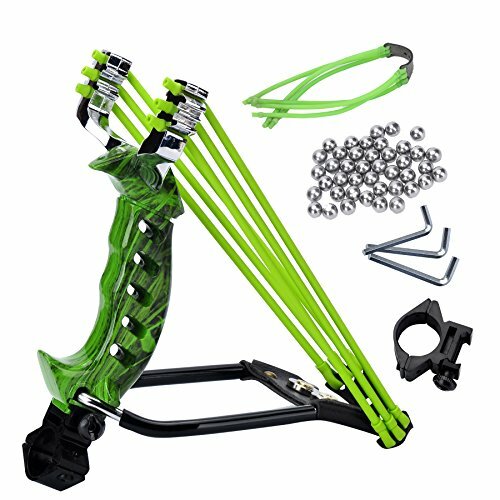 Perfect for hunters of any size, this slingshot can be an excellent product for both experienced shooters and beginners looking for a simple model to improve their aim. Slingshots tend to be a more reliable tool when it comes to ammo usage as running out is not an issue; you can use rocks that are lying around. This model has a thick launch strap that can comfortably accommodate anything you put into it. However, you can have issues with accuracy when you don’t use specialized balls. Unfortunately, the elastic bands tend to wear out rather quickly, meaning you’ll have to get it with replacements; thankfully, the manufacturer has a great customer service track record and tends to fully refund the product or replace their models if you come across any problem. This option is a great general purpose product that can deliver deadly hits on small game while providing ease of use for both veterans and beginners alike. It can accommodate different types of ammo and has a sturdy, reliable frame. Great for left and right-handed users. Design helps users avoid wrist injuries. Small leather holder doesn't provide much grip on the metal balls. 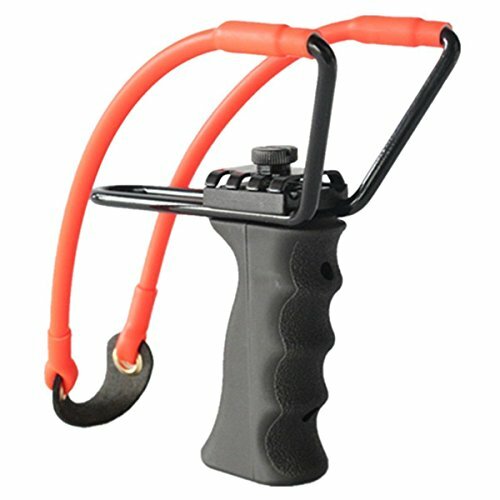 Unlike your usual slingshot, this product has six rubber bands that deliver powerful and deadly shots at longer ranges. It comes with many accessories like a forearm wrist brace that provides stability needed for a robust model like this one. One of its most iconic features is the magnetic ammo holder, which can carry 25 balls for more comfortable and quicker access. 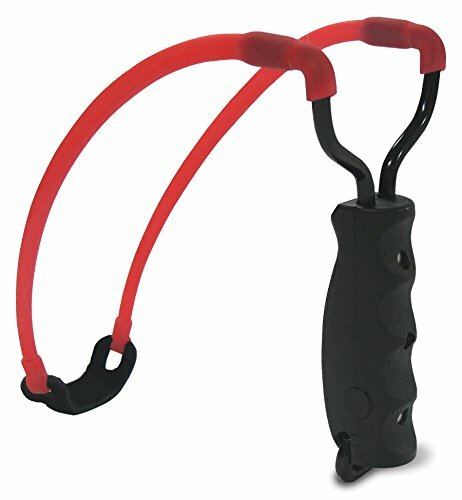 This slingshot comes with a mount that can be used to fit a flashlight for night time, while the design reduces accidents that can happen if the elastic hits your wrist. You can also equip a laser sight to provide accuracy with a traceable shot. The handle is comfortable as the whole frame has an abrasive spray paint that increases friction and decreases sweat, which results in a better grip and effective use in warm climates. The complete kit includes 200 shooting balls, accessory mount, and screw keys, as the model comes unassembled. Both left and right-handed people can use this product with ease. The holder is small, so it can be uncomfortable to pull the elastic and have a feel for the ammo, which can hinder accuracy. It weighs a total of 2.2 lbs, so while it's not the most lightweight option, it is not heavy enough for it to be a problem to carry wound. Night time hunting shouldn’t be a problem with this product as the flashlight mount can give you mobility while illuminating the areas around you. The multiple elastic band design makes it a compelling and stable device. Doesn’t have a wrist brace. Traditionality doesn’t equal less power; rather, it often means simplicity and efficiency. This slingshot looks like the common old-school choice, but it can deliver incredible power in the right hands. This option is also great for people that are either on a budget or looking for a product to start practicing. Unlike other types of devices, slingshots are not easy to master at first, so it is always advisable to practice as much as you can to improve your accuracy. Given its simple design, the Marksman 3030 doesn't have a wrist brace, but it does come with a finger-modeled sturdy grip, which offers comfortability and stability. It's also a lightweight and small model that can comfortably fit on most pockets, resulting in a great option to use for prolonged amounts of time. In terms of ammo, the slingshot can use ¼” or ⅜” steel balls, or if you feel like improvising, marbles can work on it. No elastic band lasts forever, but thankfully the replacement is easy to find. Other elastic bands similar to the Marksman 3355 can ideally be used with this alternative. If you’re on a budget and don’t want to miss out on the power that top tier slingshots can deliver then this is an excellent option. It can be a little hard to master at the beginning given the lack of a wrist brace, but if you become good with this product, you’ll be great with any other. Easy to manage for beginners. The band wears out faster than other alternatives. As I mentioned before, slingshots tend to be tricky devices for beginners, who usually need some practice to become accurate with them. This particular model is perfect for those beginning or desiring a more straightforward experience because it comes with foldable arm support that not only provides stability but is also suitable for situations where you would need to carry the product around. 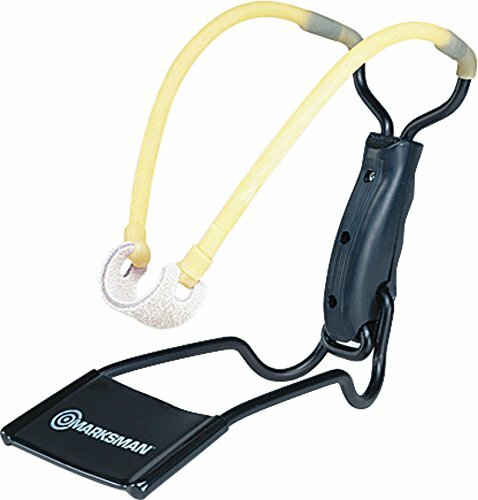 This slingshot comes with a steel tampered yoke and is excellent to use for extended amounts of time without becoming too fatigued. It demands a lot from the elastic band, which is unfortunately not as durable as others on this list. For good measure, it’s advisable to get some replacements, so you don’t have to wait if the rubber gets too deteriorated. It’s important to note that, quality aside, eye protection is a must while using any slingshot. Despite the rubber having less durability than other models, this is a great user-friendly option for people that desire a more accurate choice. Just be sure to keep in mind that acquiring a couple of spare elastics is not a bad idea. Leather band not magnetic enough to hold ammo. 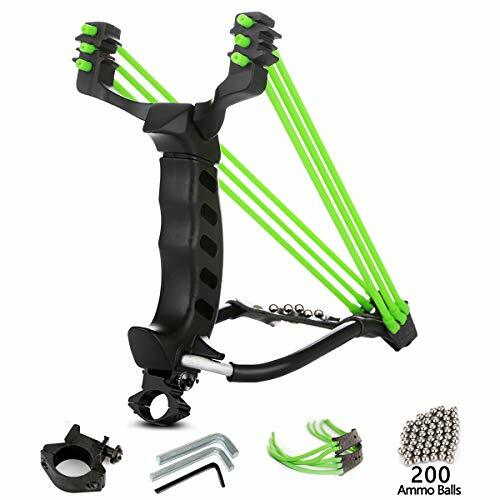 The Strong Folding Wrist Rocket Slingshot is another choice that comes with a triple rubber band design, making it a powerful and accurate device. It has an adjustable handle grip, which is excellent for people that want more customization and comfortability while maintaining a stable hand. The material is sturdy as it is all made out of metal alloy, so this product can withstand much use. While some options are more utility oriented, this model is ultimately designed to be useful for hunting. Among its other features, this model has a magnetic leather band that gives you quick access to your ammo. It can be fired with steel balls or, like any other slingshot, with other objects that you may find; keep in mind that your accuracy may decrease with objects not designed to be fired. The elastic bands on this model are durable and can withstand much use; while they can eventually start to wear out, they will last much longer than most models. The magnetic leather doesn’t always keep all the metal balls in place, which means that with sudden moves you may lose some of them. This hinders its ability to have quick access to ammo, which is something to keep in mind depending on the situation. Sometimes instead of utility, there’s only a need for raw power, and this is where devices like this one shine. If you can get past the lack of magnetic grip on the leather holder, this is an excellent choice for deadly shots. Rubber bands can be too stiff. For a more active individual, this product offers some of the most durable bands on the market. 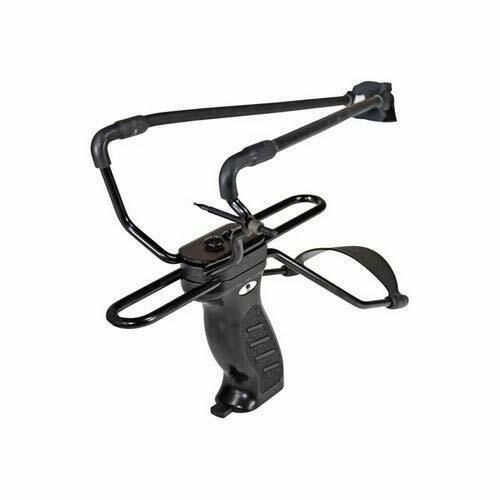 This slingshot includes an integrated wrist brace and a round leather pouch for quick shots. One of the most iconic features of this model is its in-built magazine, so the time between recharging is decreased. It can work correctly with 0.33 inch balls, and the charging module can store up to 30 balls at a time. It has a thick leather pouch but still lets you have an excellent grip on the ammo, which helps to increase accuracy. While the elastic is durable, it may be a little bit too stiff so shooting the slingshot can become fatiguing with time. This model works better with people that more seasoned with slingshots as it can deliver a significant amount of force in the hands of an experienced shooter. We hope you take what we've compiled and use it to set your sights on something elite. These models are hand-selected to ensure you have a top-notch experience, every time you take aim. Using slingshots effectively as a hunting device requires a lot more training than a gun may need. Nonetheless, they are useful and simple to operate, so when it comes to hunting small game they become compelling tools that offer a great challenge. As straightforward as they may be, there’s a lot to know about these devices, and some people may not have access to all the information about these tools. So, we’ve provided some more in-depth info to answer common questions about slingshots. Will the Rubber Bands Ever Wear Out? All elastic bands end up wearing out with time; despite their quality, it is important to know how durable a product may be in order to avoid possible injuries that can happen when the elastic gives out. It’s important to always wear eye protection when using these tools. How Far Can Slingshots Shoot? This mainly depends on the rubber band that it comes with and the draw weight you can apply to it. The more force you can apply to the band, the further and more powerful a shot will be. What Prey Are Slingshots Capable of Killing? Generally speaking, slingshots are effective in killing small animals, mainly birds and rodents. Skilled enough users may be able to get medium-sized game with these tools, but it is not advised for beginners to try to do so, as they may not achieve a humane kill. What Kind of Range do High-end Slingshots Have? While this is heavily dependent on the model and the type of ammunition that you use, a slingshot with an average draw weight of 10 lbs can be accurate for beginners at 50 ft but an experienced user may find it accurate even at 150 ft.